This series is about the different sub-specialties within car design. No matter the studio, a half-dozen different design teams are all required to provide a complete design. But the sequence and the manner in which each team is utilized may differ from studio to studio. Most studios start with 2D concept renderings, which then have to be translated into 3D. Some studios accomplish that by handing the rendering off to a computer modeler, who then interprets the drawing to realize the form in his or her screen. 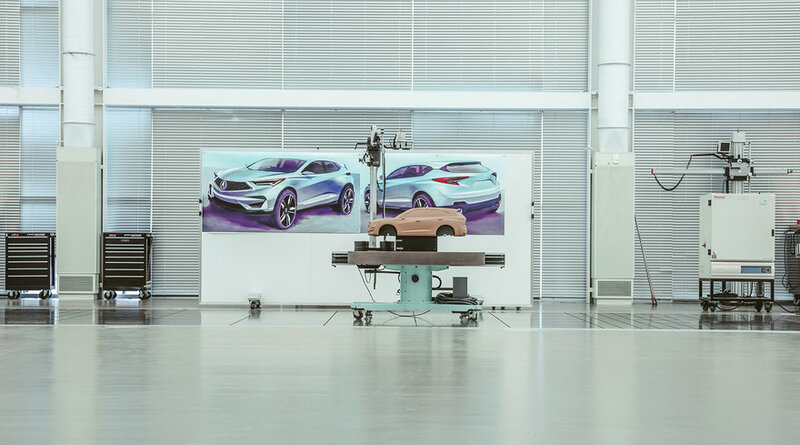 Acura’s recipe, however, is to go from concept sketch to clay, almost directly; in between, a computer modeler does interpret the sketch to get rough dimensions, estimating mechanical fit, and then a digital milling machine carves a rough approximation of a 1/4-scale model using the digital modeler’s files. But at that point the all-important clay modeler jumps in. 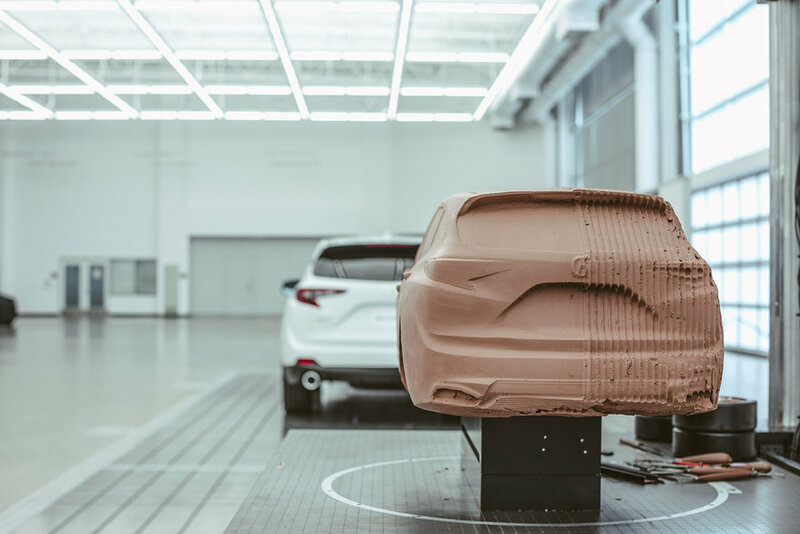 In Acura’s process, the clay modeler plays a significant role in determining the final form, using old-school hand tools, aesthetic judgment and expertise. 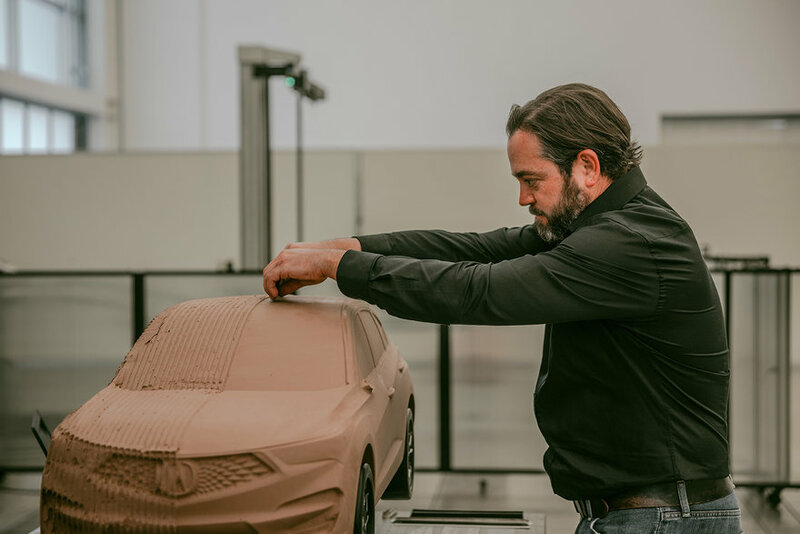 But it’s not all artistry with no science; the clay modeler will even optimize the exterior for the sake of aerodynamics, coordinating with wind tunnel testing facilities for validation. 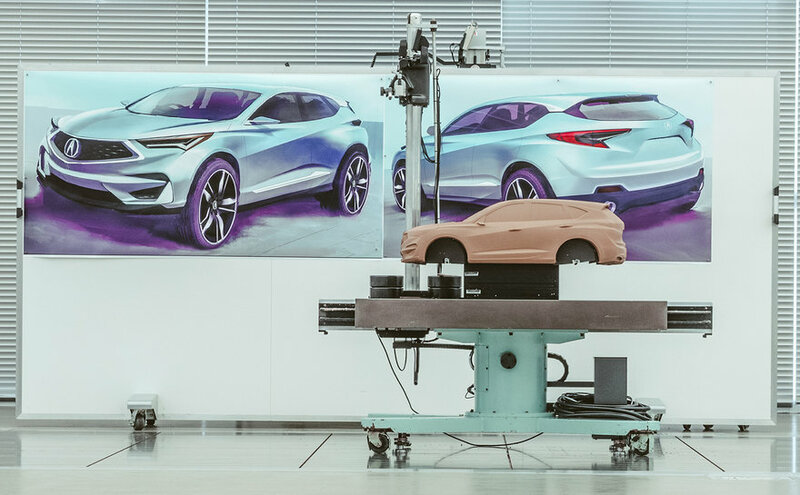 Here in Part 2 of this series, we chat with Acura Senior Design Modeler Matt Mantz. Mantz had an unusual upbringing that might’ve been common a century ago, but which is pretty rare today. We were fascinated by the role that upbringing played in Mantz’s aesthetic training. Core77: Can you describe your position, and what led you to it? Matt Mantz: Sure. It’s nice to have people come in, see what I actually do. I’m a Senior Design Modeler here at Acura. I’ve been here for about 12 years. Some of the other cars I’ve worked on are the 2014 MDX, the 2016 NSX and I was the project leader for the 2019 RDX. So before I get started–I was raised on a horse ranch in northern California and my parents had horses. I was actually a pig farmer. I went from pig farmer to car design. Yeah. On the farm I rode dirt bikes and I was also really into art as a kid. I had some good art teachers that taught me sculpture, and I really enjoyed it. I loved modeling and building things. How did you get from there to car designer? I went to school at the Academy of Art in San Francisco, and that’s where I learned clay modeling. I was recruited by another auto manufacturer and worked there for about 10 years before coming to Honda. I always loved Honda because of the dirt bikes I rode as a kid. Where do you come into the car design process here? When we get started, I’ll get these sketches from the designers, and a package drawing [of the chassis] from the engineers. It’s my job to take that sketch and put it over the package. Sometimes [that transition yields something that] looks a little funky and weird, so then we go back and forth changing the proportion of it, [while still being faithful to] the image. As you’re interpreting the sketch into the clay, what are some of the things that influence or inspire you as you’re shaping the clay? Being an artist that grew up on a ranch, I’d really studied the forms of the animals that we had. I ask myself “How does that relate to cars?” As a clay modeler, I’m trying to make the car look attractive, and I get a lot of proportions from the animals that I’ve observed, on or off the farm. I’d look at the hips of a horse, and you can see that’s where the power comes from. So I’ll put the [gestural] power over the wheels. Or look at a cheetah: It’s really lean through the middle, the power is over the shoulders. We tried to do that same thing here [indicates the RDX model], make the body look really lean and nimble, and put the fender flares on the car to try to emphasize where the power is coming from. Then there’s the eagle and the shark. The eagle is a very aerodynamic animal and aerodynamics on a car is very important. So we think about things like, how does air flow over an eagle? And how does the water flow over a shark? The animal inspiration is fascinating. How do you reconcile that with real-world performance? For one thing, we do wind tunnel testing. 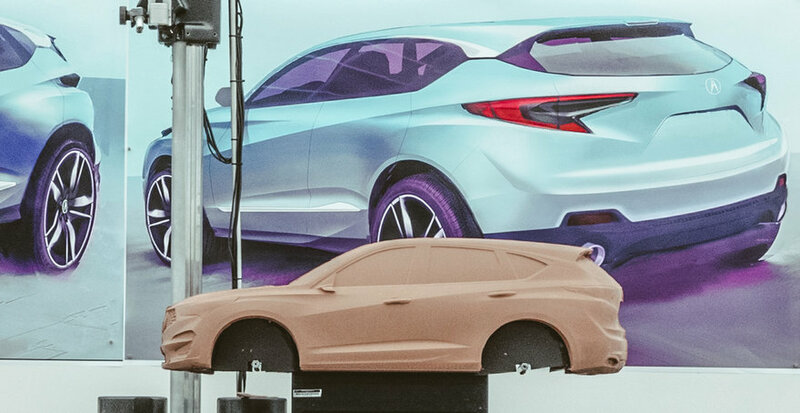 In our wind tunnel in Ohio, we’ll have [clay models of the] car mounted to these posts and as wind blows over the car, those posts are measuring the forces being pushed on the car. You get figures for drag, lift, yaw, all kinds of different forces. Then we’ll make actual changes to the clay model while it’s in the wind tunnel. 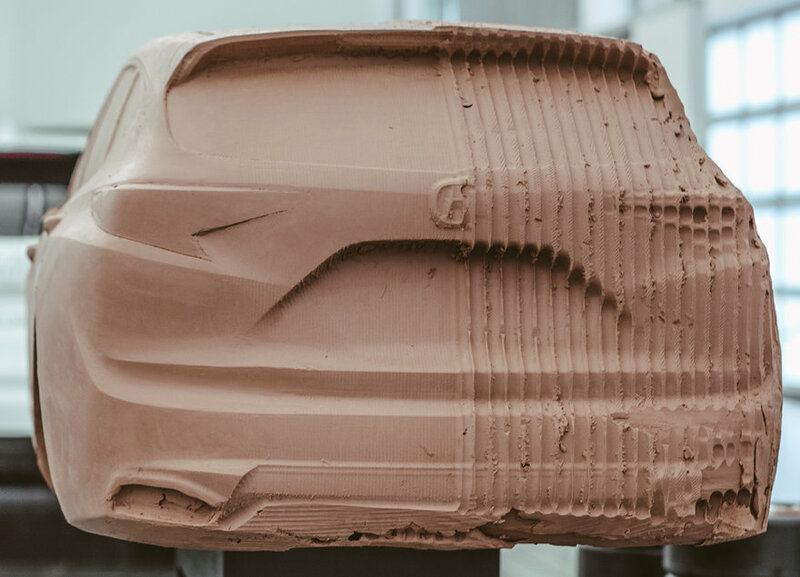 Digital tools have changed the car design process over the years, but one thing that’s the same now as it was 50 years ago is clay. Can you talk about why? Everyone asks, why do we still use clay, and there’s a number of reasons. Number one is, the evaluators want to not only see the car, but feel it. We could show the car digitally, but you can’t actually feel a digital model on the screen. Another reason is because we make a lot of changes to this as we’re going through the development. For example, [in the middle of the design process] the hood on this thing had to be raised to meet some pedestrian impact standards. So, clay is a material that can be easily added and removed and it’s always very accurate. We can control the accuracy on this. Other materials would either be slower to use or not quite as accurate. We do use some digital tools now [points to a nearby milling machine]. We do a lot of digital modeling, but those are just another tool in my toolbox, to speed up the process. I have my analog tools and my digital tools. Can you talk about the interchanges between the two? So by hand, we’ll actually concentrate on one side of the car, usually the entire driver’s side. Then we’ll scan the car and use the digital mill to mirror the passenger side of the car. There’s two benefits to this: One, the mill can keep working overnight, when I’m at home, and two, it’s much quicker than I can do it. It would probably take us three days to mirror the full passenger side of this car, but for me to do that by hand might take three weeks. Were you there for the digital transition? From when you had to do both halves of a car by hand to when the mill came in? That lasted until maybe 10 years ago. Everybody’s using the 3D scanning and the mill tools now. Is there still handwork to do after the mill cuts the other half? So the mill leaves a surface that’s–I left this side rough so you guys can see it. Even the finished cut of the mill, you can see it has a little bit of a texture to it. So we’ll take that texture off [with hand tools] before we view the car. 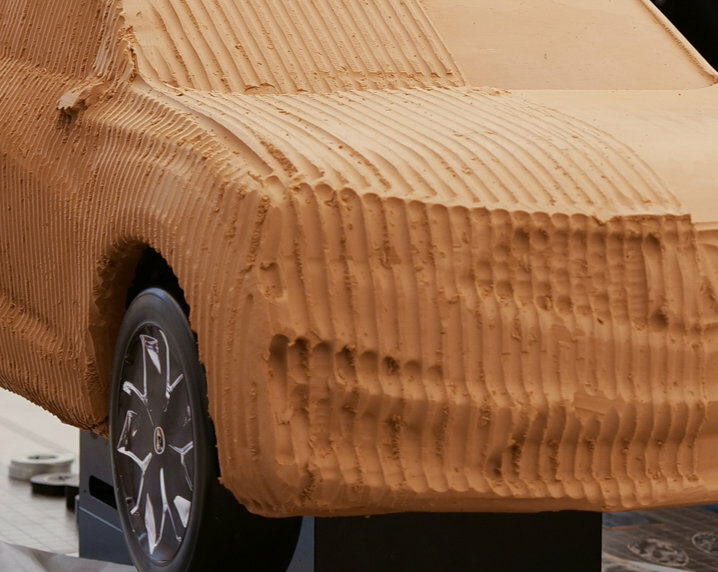 Is the car evaluated with just the clay finish? No, we use ScotchCal film over the entire car. It’s almost like wallpaper, it’s got glue on the back. You soak the ScotchCal and then it’s like a big sticker sheet. We’ll use different colors for the headlights, the grille, that kind of stuff. And then how do they–for a clay model, what’s the equivalent of marking up a sketch for revisions? We use tape. Dave [Marek, Acura’s Executive Creative Director] will tape different lines on the car to communicate revisions to the designers. I have another design director who uses aluminum wire, he’ll say, “I think this shape should be flatter here–” and he’ll bend the wire and stick it on here. Those are very good communication tools, I can see exactly what they’re talking about. Then we’ll come back in and remodel based on those lines. 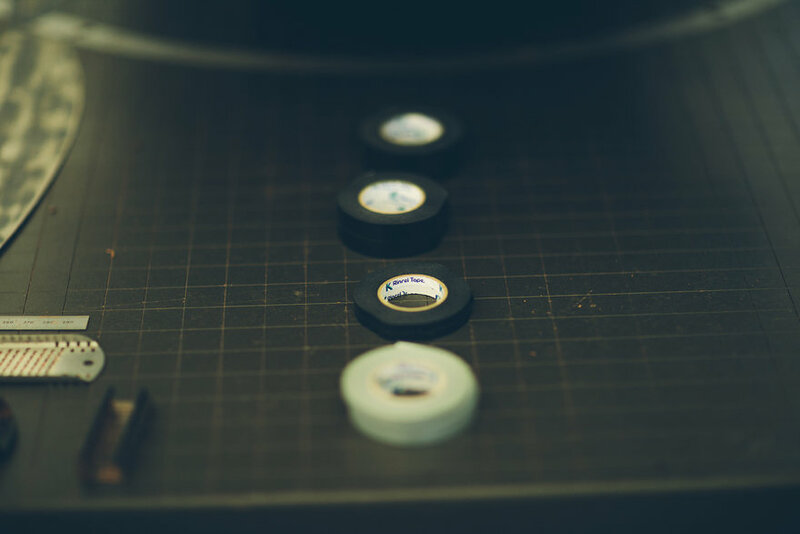 How do concerns about manufacturability affect your work? There’s thousands of regulations based on safety, stamping–can the metal be stamped into this form? Sometimes we’ll create a shape that is so formed that when they try to stamp it, it just rips the metal. So they’ll come back to us and say, “Look, you’ve pushed it too far, we can’t stretch the metal that far. You’ve got to bring it back a little bit.” So then it’s, can you create the same shape, the same feeling, with a little bit less draw to the metal. So, we go back and forth. Then there’s other changes needed–what I was talking about before with the bumper beam was, an engineer needed to make changes to the chassis for safety, and the form we had didn’t allow for the bumper beam to be hidden behind it. It would have been sticking out of the car. Can you talk about why you guys work in 1/4 scale? The clay process is a two-year process, and we start with 1/4 scale because we can make a lot of big changes very rapidly. If they want to move the windshield forward a hundred millimeters, it’s only 25 millimeters of material for us. If you had to do that in full size, that’s a lot. We try to get the main proportion of the car set in the 1/4 scale. Then we’ll scan the 1/4 scale car, mill out a full-sized buck, and do the same thing. We’ll sculpt on that for probably a year, while we’re going back and forth with the engineers about regulations, stamping. Do issues crop up when you go from the 1/4-size model to a full-size? So, in 1/4-size, a lot of times–we call it cheating, but we try to cheat the model to make it look better for the evaluators. We’ll make the fenders look a little bigger, add a little more curvature, a little more puff to them. But when you blow that up to a full size model, now they look like balloons. So we’ll make the 1/4-scale look good and after they buy off on it, we’ll fix it and tune it on the full-scale. 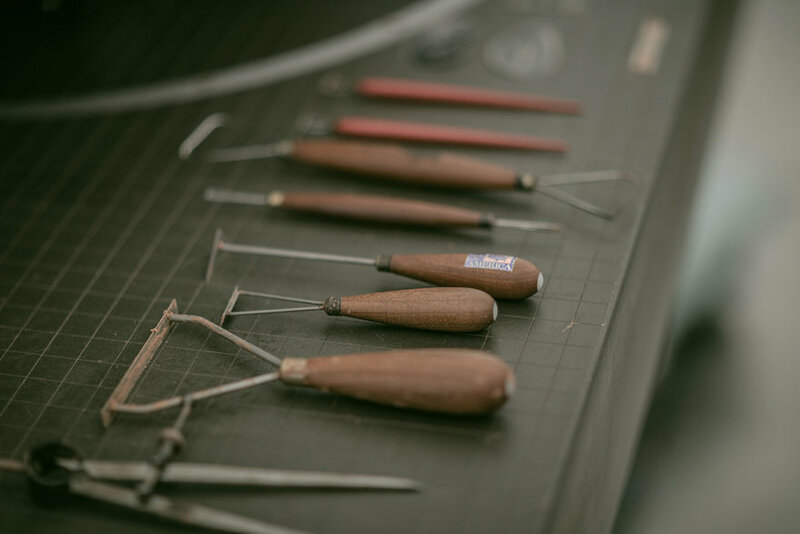 [Looking at Mantz’s hand tools] Did you make these yourself? Most of my tools you can buy at a clay shop, but all my steels are handmade. Sometimes I won’t have a tool that fits the exact shape that I need, so I just take one with a generic end and modify it into whatever shape I want. 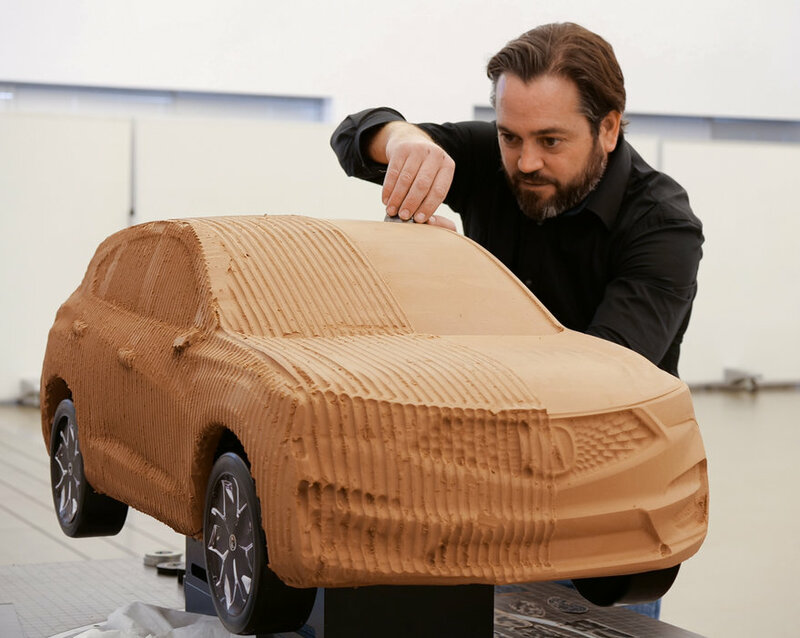 Once you decided you wanted to do car design, what drew you specifically to the clay modeling side? When I was going through art school, we did all the different aspects of design: Research, sketching, clay modeling. I actually really enjoyed the research, I thought that was really fun–researching different companies, the customer, who are we making this product for. Sitting down and sketching on paper, two-dimensionally, was not that much fun; it’s really hard for me to do that. But as soon as we got into the clay model, it was really easy for me. My teachers saw that and recommended to me, “Hey, you should really be a clay modeler over being a designer. You’re really good at it.” And honestly, it’s a really good career. It’s tough being a designer. These guys have to perform all the time. I get to take their sketches and create this. 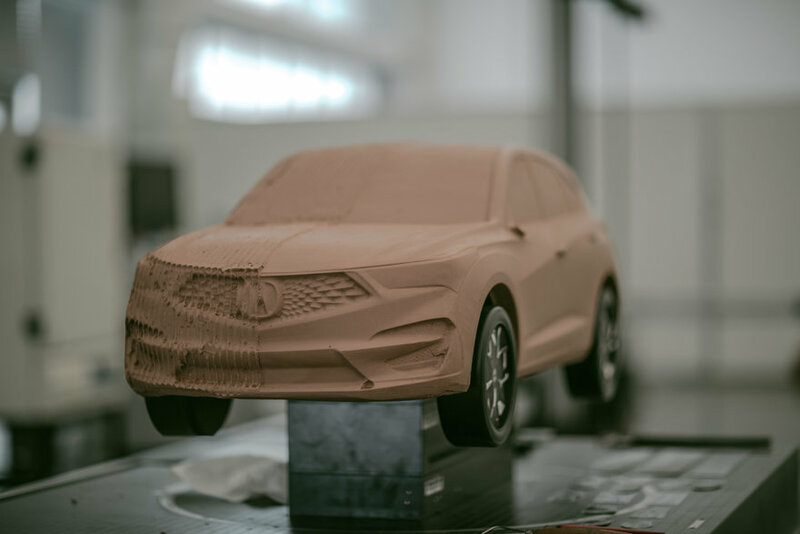 Also, some companies are more reliant on the Alias digital modeling, and one cool thing about Acura is that we still rely heavily on the clay model. The “touch, feel” is so engraved in, and you just can’t touch a digital model. A benefit I try to explain to people about clay is: Let’s say I’m tuning and adjusting [a character line in the body], maybe a quarter of a millimeter over the entire line here. When I’m looking at this line and I’m this close to it, I can still see the rest of the car. So I have that reference there. When you do that on the computer screen, you can zoom in on the detail or you can look down the car, but you can’t see them both at the same time. So the clay allows us to reference the entire car and see the details at the same time. Up Next: Once the clay model is complete, it’s time to turn the data into digital files that can be manipulated in CAD. In steps the Digital Modeler. Stay tuned!